What are the symptoms and signs of double vision? What tests do health care professionals use to diagnose the cause of double vision? What is the treatment for double vision? What types of doctors treat double vision? Is it possible to prevent double vision? What is the prognosis for double vision? Dr. Bainter is a board-certified ophthalmologist. She received her BA from Pomona College in Claremont, CA, and her MD from the University of Colorado in Denver, CO. She completed an internal medicine internship at St. Joseph Hospital in Denver, CO, followed by an ophthalmology residency and a cornea and external disease fellowship, both at the University of Colorado. She became board certified by the American Board of Ophthalmology in 1998 and recertified in 2008. She is a fellow of the American Academy of Ophthalmology. Dr. Bainter practices general ophthalmology including cataract surgery and management of corneal and anterior segment diseases. She has volunteered in eye clinics in the Dominican Republic and Bosnia. She currently practices at One to One Eye Care in San Diego, CA. Double vision is the perception of two images of a single object seen adjacent to each other (horizontally, vertically, or obliquely) or overlapping. Diplopia is the medical term for double vision. Polyplopia is the perception of three or more images of a single object overlapping each other. Double vision is called "monocular" when the double image is perceived by an eye that is tested alone. In "binocular" double vision, each eye sees a single image when tested alone, but a double image is present when both eyes are open. Most causes of monocular diplopia stem from poor focusing of light by the eye. Refractive errors (myopia, hyperopia, astigmatism) are causes. Dry eye (from a variety of causes such as meibomitis, Sjögren's syndrome, and decreased tear production following refractive surgery) can produce diplopia that varies with blinking. Cataracts (clouding of the natural lens) and posterior capsule opacification (which can occur after cataract surgery) are common in people over 60 years of age and can produce diplopia along with other vision problems. Other conditions that interfere with proper focusing of light include corneal irregularity from keratoconus, swelling or scars, and retinal conditions such as epiretinal membranes. Rarely is the underlying cause a medical emergency in cases of monocular diplopia. Binocular diplopia on the other hand is produced by a misalignment of the two eyes, which in some instances can be caused by life-threatening conditions. For example, aneurysms, strokes, trauma (head injury), and increased intracranial pressure (for example, from a growth or mass such as a brain tumor) can cause eye misalignment by affecting the nerves that control eye movement and alignment. . These nerves control the extraocular muscles that move the eyes in different direction of gaze. If these nerves lose blood supply or are compressed, the muscles they control become weak or paralyzed. This is called a cranial nerve palsy. Other diseases affecting the nervous system can lead to binocular double vision. In multiple sclerosis, nervous system inflammatory lesions that affect various parts of the visual system may result in double vision that varies over time. Guillain-Barré syndrome can also produce double vision from nerve damage. Migraine headaches can cause a sudden but temporary strabismus (eye misalignment). In myasthenia gravis, the communication between the nerves and the eye muscles is abnormal, resulting in diplopia that varies by the time of day, typically worsening with fatigue. Binocular double vision can also occur with damage to the eye muscles themselves. Graves' disease (often associated with thyroid disease), orbital inflammations, vascular disease (as seen with diabetes and high blood pressure), and others are examples of diseases that directly affect the extraocular muscles through compression, poor blood supply, or local eye inflammation. Eye movement and alignment can also be abnormal if muscles and orbital tissue become trapped in a skull bone fracture from trauma, leading to restriction of eye movement in certain directions of gaze. Childhood strabismus (eye misalignment), such as crossed eyes (esotropia) or out-turned eyes (exotropia), occasionally produces double vision, and often children develop ways to suppress the double vision. However, this suppression may result in amblyopia (a weakening of the eye's visual development). For this reason, children whose eyes appear misaligned should be evaluated by an eye doctor for treatment that may range from glasses, vision therapy, and patching to surgery. Sometimes the cause of binocular double vision is relatively harmless, such as when fatigue or illness results in a temporary misalignment of the eyes. This is called a phoria, which is a variable, intermittent type of strabismus (eye misalignment). Another fatigue-related misalignment is convergence insufficiency, which is the inability to keep the eyes converged (slightly crossed) for long periods while reading. This can often be alleviated with eye exercises ("pencil pushups" vision therapy) or prism glasses. Double vision, or "seeing double," occurs when two nonmatching images are sent to the part of the brain that is responsible for processing visual input. If this occurs over the long term, the brain will eventually compensate for the two signals by suppressing one signal, so that a single image is perceived. Images may appear to overlap each other or may appear adjacent to each other. This can lead to other symptoms, such as blurred vision and dizziness. The double vision may be monocular (one or both eyes sees multiple images when tested individually) or binocular (double vision is seen only when both eyes are open, but each eye sees a single image when tested individually). Double vision can be constant or variable. For example, double vision that varies with blinking is often related to irregularities of the eye's surface. Binocular diplopia may vary depending on the direction of gaze or with tilting or turning of the head. Fatigue may also contribute to variable double vision. A thorough evaluation of double vision begins with a detailed history, including onset (gradual or sudden), duration, frequency (intermittent or constant), and variability with fatigue, head position, or direction of eye gaze, noting any associated symptoms (pain, headache, nausea, and weight loss among others) and other vision problems. A complete history of past and current medical conditions is reviewed. The physical examination to assess eye health includes measuring the vision (visual acuity) in each eye and assessing whether the diplopia is monocular or binocular. Careful examination of the eyes' alignment in various head positions is performed if the diplopia is binocular. A complete eye examination, which may include dilating the eyes, is performed to look for any ocular or orbital abnormalities. Particular attention is paid to the pupils and eyelid position if a neurologic cause is suspected. In some instances, specialized imaging (topography, CT, MRI, etc.) and other tests are needed to further investigate possible causes. When a life- or vision-threatening cause is suspected, time is of the essence. Once the underlying cause has been determined, treatment is tailored to the underlying condition. For example, diplopia stemming from refractive errors (myopia, hyperopia, astigmatism) can be corrected with glasses or contact lenses. Dry eyes may be treated with artificial tears, anti-inflammatory drops, punctal plugs, warm compresses, and a variety of other treatments. Many corneal irregularities are treatable with medication, laser, or surgery. Cataracts are treated with surgery, and posterior capsule opacification (after cataract surgery) is treated with laser. Binocular diplopia is occasionally caused by vision-threatening or life-threatening conditions requiring urgent or emergent treatment. This is particularly the case with aneurysms, head trauma, stroke, and other neurologic conditions. Any onset of diplopia with accompanying neurologic symptoms such as headache, nausea, dizziness, loss of balance, etc., should be evaluated immediately. In many cases, double vision may subside with treatment of the underlying disease. Double vision produced by poor blood supply to the nerves in diabetes will often resolve over time as the blood sugar is brought under better control. If eye muscle movements are restricted due to scarring (such as chronic Graves' disease) or entrapment (as after traumatic orbital bone fracture), surgery of the muscles or surrounding tissue may correct the problem. Convergence insufficiency, or inability to align the eyes when focusing on a near object, is a common benign cause of intermittent binocular diplopia when reading. It can improve with eye exercises (pencil pushups) or with use of prisms. Often glasses with prisms can be worn to correct binocular diplopia. If the diplopia is expected to resolve, temporary prisms (Fresnel prisms) can be added to glasses and later removed when the eyes realign. Eye doctors (optometrists and ophthalmologists) can perform the assessment and treat underlying ocular diseases. The primary care doctor (family practitioner, internist, or pediatrician) is often involved when an underlying systemic is causing the double vision. In some cases, specialists such as neurologists, endocrinologists, and neurosurgeons may also be called upon to provide treatment. If the underlying cause is preventable, your physician will suggest ways to minimize chance of recurrence. The prognosis is dependent on the underlying cause. Monocular diplopia due to blurred vision has a good prognosis as long as the underlying cause of the blur is correctable. Binocular diplopia may resolve with treatment of the underlying cause, however, in some instances, there may be permanent misalignment of the eyes due to nerve or muscle damage or scarring. If surgical realignment is insufficient or not an option, glasses with prisms might help in some cases. Friedman, D.I. "Pearls: Diplopia." Semin Neurol 30.1 Feb. 2010: 54-65. Gunton, K.B., A. Brown. "Prism Use in Adult Diplopia." Curr Opin Ophthalmol 23.5 Sept. 2012: 400-404. Trying to get rid of pink eye? If you woke up with crusty eyelids and red, swollen eyes, you may have pink eye also called conjunctivitis. Find out how to diagnose and treat pink eye. What was the cause of your double vision? Describe the symptoms associated with your double vision. Please discuss the events that led to a diagnosis of double vision. Depending on the diagnosis, what was the treatment for your double vision? Learn how look for signs and symptoms food poisoning. Discover ways to keep your food safe from dangers including listeria, E. coli, salmonella and more. Eyelid surgery, also called blepharoplasty, is a cosmetic procedure in which drooping of the lower and/or upper eyelids is reduced by removing excess skin, muscle, and fat. Complications of the procedure include bleeding, infection, dry eyes, an inability to fully close the eyes, eyelid skin that folds in or out abnormally, abnormal skin discoloration of the eyelids, and a pulled-down lower lid lash line or a possible loss of vision. 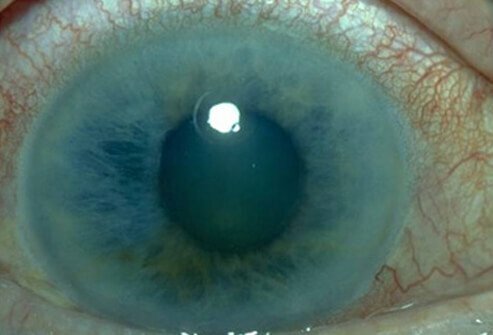 What are cataracts and who gets them? Take this online quiz to learn how everyday activities may put you at risk. Cataracts are a painless clouding of the internal lens of the eye. Learn about symptoms (blurry vision, glare and poor night vision), causes, treatment (including surgery) and recovery. The eye has a number of components which include but are not limited to the cornea, iris, pupil, lens, retina, macula, optic nerve, choroid and vitreous. See a picture of Eye Anatomy Detail and learn more about the health topic. Eye diseases can cause damage and blindness if not detected and treated soon enough. Learn the warning signs and symptoms of common eye conditions such as glaucoma, cataracts, pink eye, macular degeneration and more. What do you know about your eyes? Take this quick quiz to learn about a range of eye diseases and conditions. Graves' disease is an autoimmune disease that affects the thyroid. Some of the symptoms of Graves' disease include hand tremors, rapid heartbeat, trouble sleeping, enlarged thyroid, thinning of the skin or fine brittle hair. Causes of Graves' disease are thought to be multifactorial such as genes, gender, stress, and infection. Treatment for Graves' disease is generally medication. How does LASIK work? Get information on this popular laser eye surgery, the procedure, success rates, and possible vision side effects. Shingles, or herpes zoster, is a painful rash caused by the varicella zoster virus. Other shingles symptoms include headache, fever, nausea, and body aches. Treatment focuses on pain management and shortening the duration of the illness with antiviral medications. Take the quiz and find out the causes, symptoms, treatments, and ways to prevent the confusing balance disorder called vertigo.